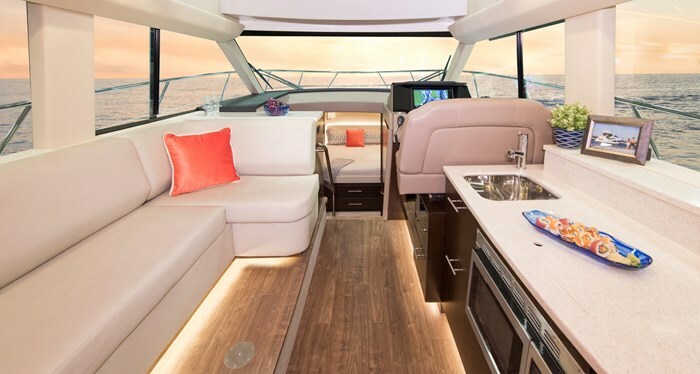 Regal Boats’ all new 42 Fly is its first flybridge offering in many years and shares its interior layout, amenities, and features with Regal’s all new Sport Yacht, the 42 Grande Coupe. 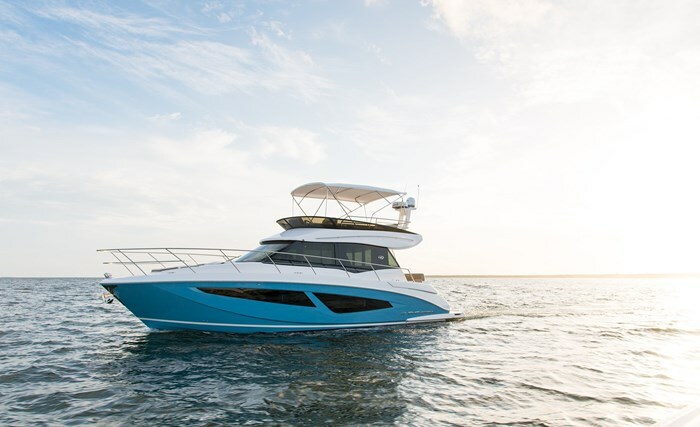 These are two of Regal Boats’ new offerings for 2017 which comprise thirty-nine models in six series from nineteen to fifty-three feet. The 42 Grande Coupe and this 42 Fly feature a dramatic departure for Regal in terms of interior layout. Where its Sport Yachts series from thirty-five to fifty-three feet have always provided a very complete galley plus dinette table in the lower salon, these two new models move both of these up to the main salon which offers a single level floor aft from the helm station right to the transom. This is perfect for entertaining and socializing. Even the stateroom layout is open and airy feeling. A more than double-wide hidden pocket privacy door system provides wide-open access to the forward stateroom furnished with a standard height “California Olympic” queen bed with innerspring mattress, walk-around room on both sides, 32-inch TV with DVD player, and a cedar-lined hanging locker with drawers. 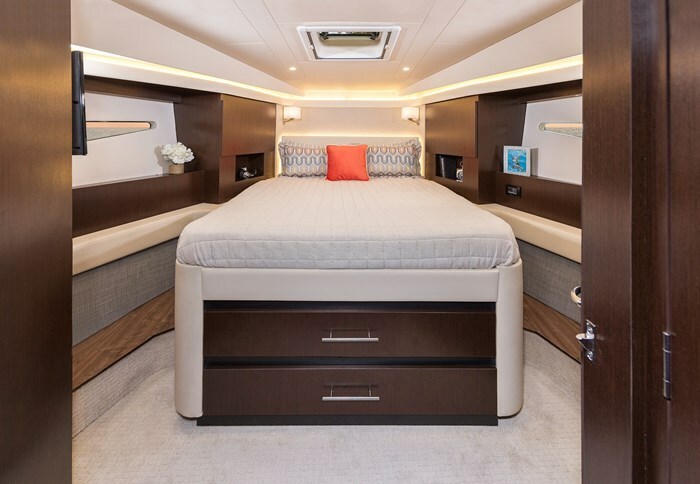 A step down leads to the aft stateroom with its twin berths with innerspring mattresses and upholstered headboard that convert into a king-size bed. Also in here is a cedar-lined armoire with storage drawers, a settee/sofa, plus another 32-inch TV with DVD with BluRay connection. Privacy doors for this aft stateroom are optionally available. 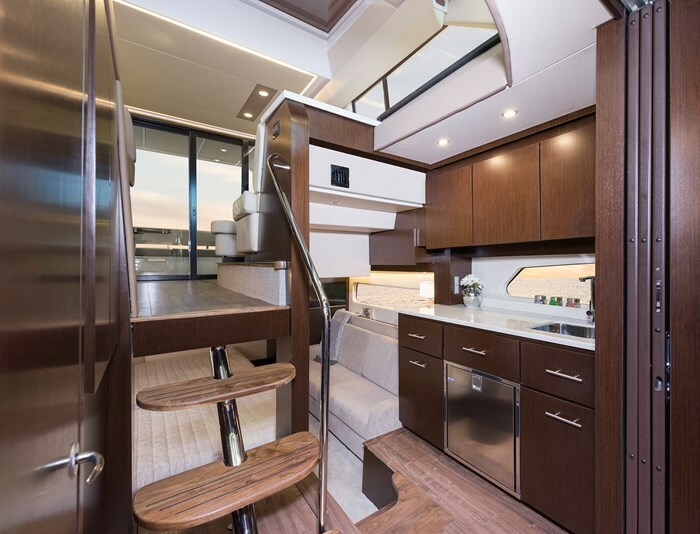 Between these two staterooms is a refreshment centre with sink, storage drawers, plus optionally available refrigerator. 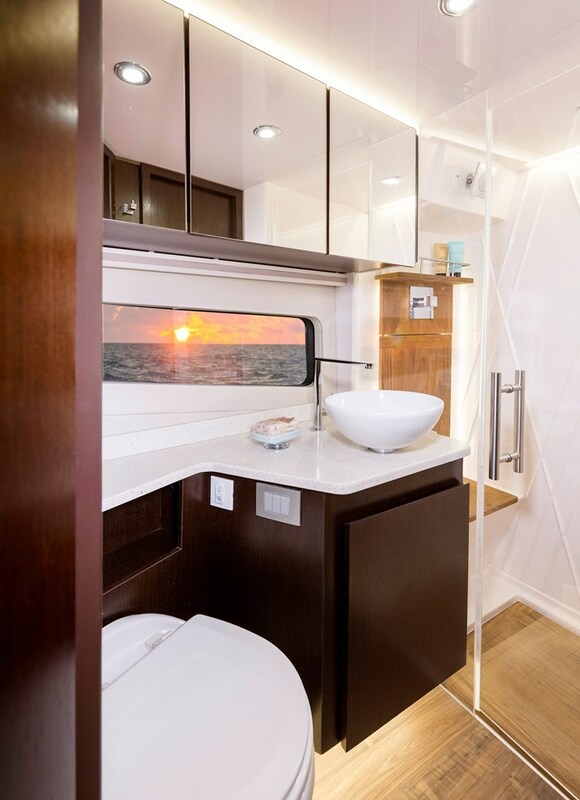 Opposite on the starboard side is the head compartment with glass vessel sink, toilet, vanity storage, plus a separate shower stall with teak floor and seat. Two large hullside windows on each side provide plenty of natural lighting to these areas below deck. In the main-level salon completely surrounded by windows, a full length L-shaped convertible lounge with table fills the port side aft to the full-height sliding glass cockpit enclosure doors. 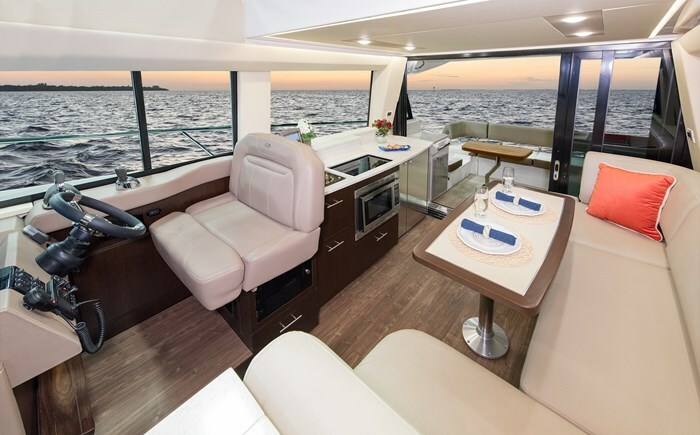 Opposite, aft of the raised double-wide, adjustable lower helm seat with flip-up forward bolster is a full length galley complete with sink, glass-top stove, microwave/convection oven, refrigerator and freezer. 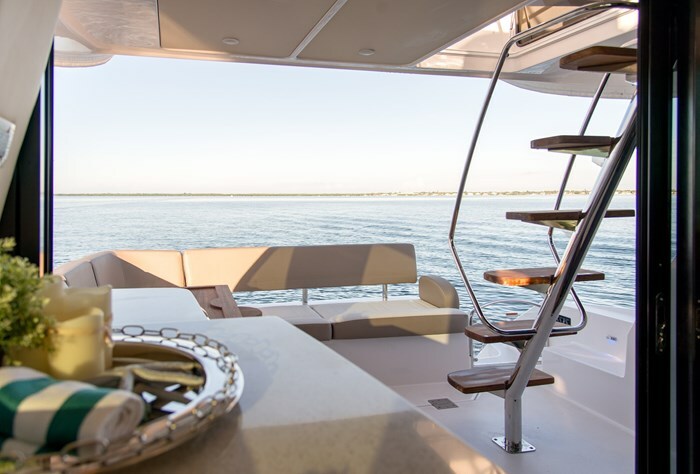 At the back of the galley countertop is a retractable 40-inch TV. Aft of the galley and past the enclosure doors in the cockpit is a standard integrated electric smokeless grill with under-counter refrigerator. 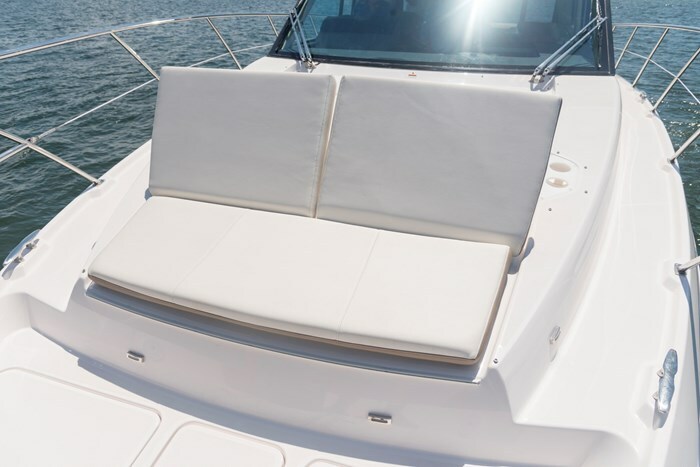 Aft of this is an L-shaped cockpit lounge seat with storage which fills across the transom to the port side entry gate to the integrated swim platform. A starboard section of this lounge removes for foredeck walk-around access or for assistance in docking. Snap-in Seagrass cockpit floor covering is standard as is a Palm Beach cockpit cover. A large transom storage trunk is provided as is a four-step boarding ladder. 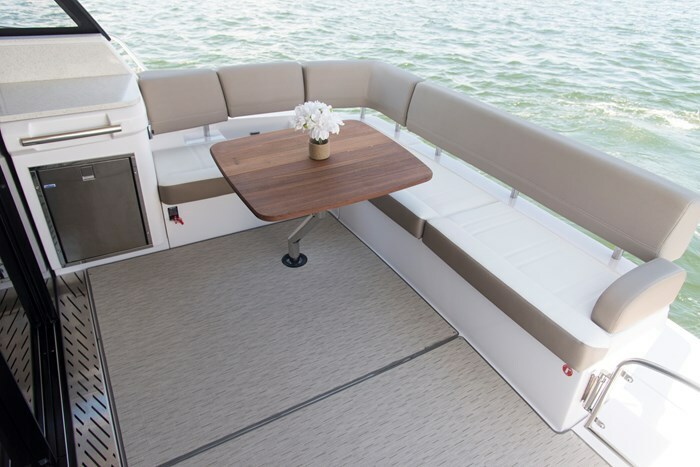 A port side open teak staircase leads from the cockpit up to the flybridge deck with its helm seat aft of which is an L-shaped lounge with storage below and a passenger seat which doubles as a multi-position “Ultralounge.” White seat covers are provided as is a bimini top and a tinted acrylic venturi windscreen. 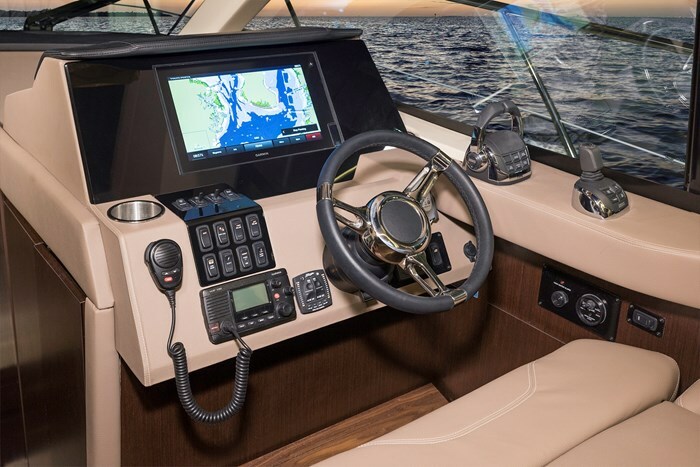 Both upper and lower helms feature a vinyl-wrapped dash and steering wheel plus Volvo’s 16-inch full customizable glass cockpit with Garmin 761 chart plotter interface. Volvo keyless ignition is standard as is Joystick steering, cruise control, autopilot, and a Garmin VHF 100 radio. Volvo IPS diesel power is available from twin 740 hp D6 IPS 500’s or 870 hp D6 IPS 600’s, both with electronic shift. 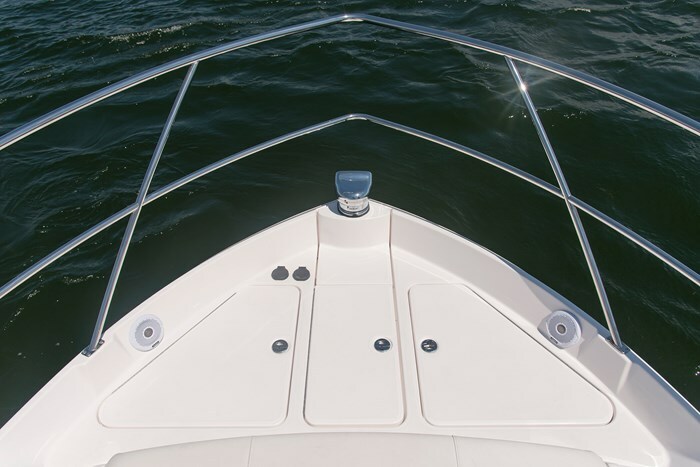 Additional notable standard equipment includes an 11 kw generator, anchor windlass, trim tabs, three reverse cycle heating/air conditioning units, Fusion UD750 marine stereo, multi-reclining position double-wide foredeck chaise lounge, blue LED underwater lighting, remote spotlight, port and starboard windshield wipers with washers, plus bottom paint. 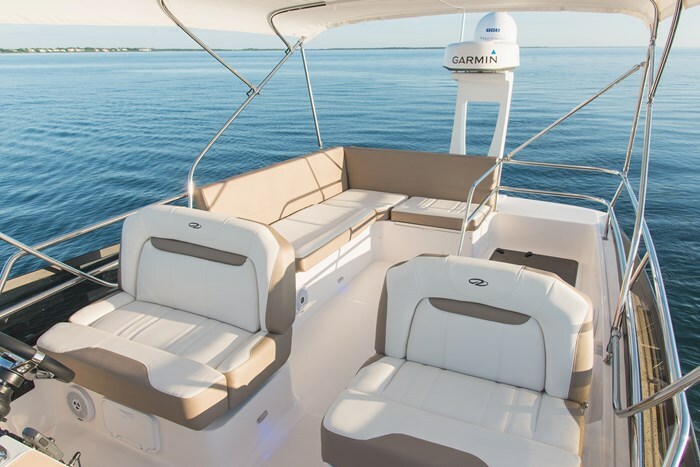 Notable optional equipment includes cockpit Isinglass or Palm Beach Patio enclosure, teak cockpit table, foredeck Cabana shade, power swim platform, flybridge teak table and drawer refrigerator, satellite TV and stereo receivers, central vac, SeaKeeper 5 stabilization system, radar, plus dual Volvo 12-inch Glass Cockpit chartplotters. 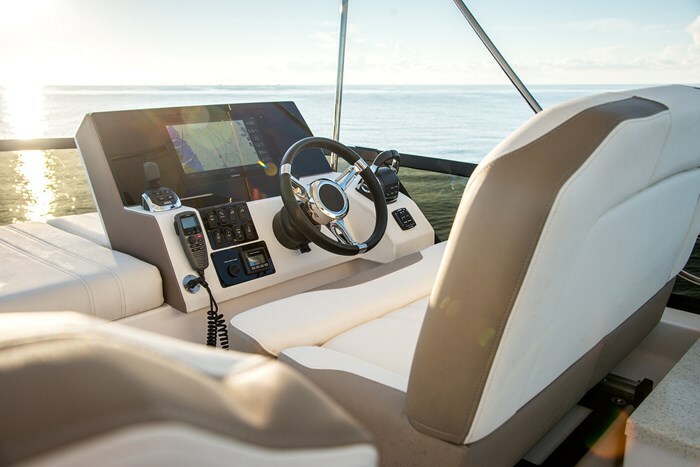 The all-new Regal 42 Fly is truly new and innovative in so many ways.